The countdown begins (about 2 weeks) ’til classes are over. This almost equates to the fact that my eating out days are coming to an end as well. At least, I get time to spend at home or at a friend’s home, baking or cooking something instead of buying food, but that would be around the Christmas and New Year holidays. This week I went to three venues that is a little bit of something to note. 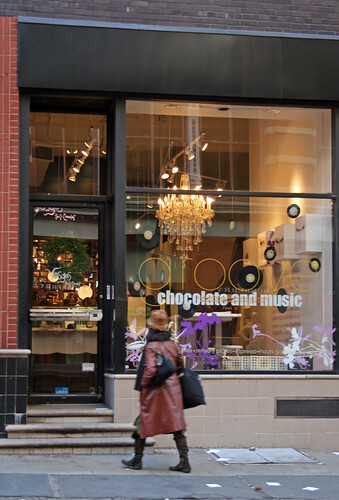 On Tuesday afternoon, I went down to SoHo to try Vosgues Haut Chocolat‘s hot chocolate. I’ve read that their “Bianca” white hot chocolate is interestingly good so I went down there just to try it and because it was really cold. It’s a really fashionable store, at least it’s trying to be very chic and as you can tell by their windows, quite loud. Once I wandered to their shelves of chocolate, I stared out in contemplation just to figure out whether or not should I buy anything else besides the Bianca white hot chocolate. No, it’s not that their truffles taste disgusting; it’s just the fact that it’s not my favorite flavors; that I might consider as an acquired taste. The one I tasted was a fennel infused truffle that was quite pungent and spicy that the flavors really cleared my sinuses pretty good. The Bianca white hot chocolate cost me $5 and the box of caramels (contains 4) was 9.50; total with tax came out to $15.71. The Bianca was a bit of a disappointment because I was expecting the white chocolate to shine with the beautiful aromas of citrus and lavender. What I actually got was a pre-made refrigerated mix that is just steamed up to the desired temperature and it tasted milky than white chocolate-y. The positive aspect was that it was not cloyingly sweet as most white hot chocolates can be and the lovely, bright citrus aroma was steaming out of that tall glass. Besides those characteristics, I tasted vanilla and a hint of lavender (but it was almost muted from the vanilla). It’s ok, probably I should try their Parisienne (plain dark) or Aztec (chili) hot chocolate next time or just buy a box of their cocoa and make it at home. To see the which caramels are, click here. My favorite out of the whole group was the Blood Orange Caramel because of the bright, slightly acidic blood orange flavor was a nice contrast to the dark chocolate that enrobed this caramel. The Bee Pollen was pretty good, too. shu mai or dumplings. When we finally met (she was late from work due to a deadline crunch), she decided to go to Ajisen Restaurant in Chinatown. It’s a good choice since it’s freaking cold, a bowl of soup and noodles is comfort food for me…and I was hungry. When we were seated and flipped through the menu, they provided us a warm cup of jasmine tea, which tasted fine. The prices on the menu was a bit higher than what we saw in Menupages; most likely they didn’t update their menu on that site. Anyways, I just committed myself to a bowl of their namesake ramen; Kim was really hungry and went for a plate of gyozas and bbq pork rice. My bowl of ramen consisted of miso broth, ramen, bean sprouts, half a hard boiled egg, julienned wood ear fungi, chopped scallions, and a few slices of lean pork (possibly roasted beforehand?). Everything tasted good but the miso broth is a bit too salty to drink. Kim’s barbecue pork rice was basically chopped up roasted pork and bean sprouts sprinkled with scallions; it looks good. The pork tasted really good. Most likely the pork meat came from the belly section or the shoulder since some of the pieces were fatty but it was tasty, especially that sauce or marinade they use that covered the tender, succulent pork. Then her plate of gyozas or dumplings came a few minutes later. It looks perfectly done with a beautiful golden brown char on the bottom. She let me have one of her gyozas and it tasted fine. It’s filled with lots of chives and napa cabbage and a tiny bit of meat. My only complaint was that it was too watery on the inside, most likely from the vegetation in that filling. Our tab was about $17 with tax and tip; not bad for a nice atmosphere, good service, and food. Finally, I had lunch with another friend of mine from St. John’s, Zaida. We known each other because I used to work as a student worker back in my days there. Anyways, the main reason, at least mine, is to give her Christmas presents and at least I get to see her. It’s been four months since we’ve seen each other, so it’s a happy occasion. Originally we planned to have breakfast at 10 AM but since she lives up in the Bronx and the bus that she takes to her nearest subway station took forever, we eventually met around 11. So, she told me she was starving and the nearest place that I know that isn’t terribly expensive and has a good atmosphere to hangout and catch up was Tisserie. Zaida is a somewhat of an adventurous food eater but not too keen on the cooking/baking aspect. She knows I’m a total nut about food and she finds me amusing to the fact that I take pictures of food…probably because I think I didn’t tell her I write a food blog. Oops. Anyways, she’s buying lunch for me and we contemplated for a good five minutes on what the heck we want to eat. All we both know is that we want some caffeine. After going up and down their display cases, we decided on splitting a sandwich and we get our own desserts. So, we ordered a smoked turkey sandwich, I have the chocolate mousse cake and regular coffee, and Zaida has the fruit tart and a vanilla latte. The total came a little under $23 with tax. The sandwich looks scrumptious and cheesy. Did I mention I love cheese? The bread was actually encrusted with some type of cheese, probably Parmesan, filled with chopped lettuce, sprouts, slices of smoked turkey and a mild semi-soft cheese (the name eludes me at the moment) with a Balsamic dressing on it. The combination of flavors and textures go together superbly; I liked the Balsamic dressing because it brought some acidity and sweetness to the sandwich that makes it more appealing to eat besides lots of cheese (not like it’s a bad thing). Before I talk about this cake, I should mention that Tisserie sells macarons. I was tempted to have on but something tells me that their macarons aren’t stellar good though. I might try one when I visit here in the future. It looks good and chocolatey with a decorative chocolate loop and a hard caramel enrobed hazelnut. The mousse is very light and airy in texture and the chocolate is about 60-65% cocoa. It was lined with a very thin film of sponge cake as a base and the chocolate mousse had some kind of nut liqueur flavor in it, possibly amaretto or Frangelico. It’s not the best chocolate mousse I ever had but it tasted fine. After our lunch we strolled around Union Square’s Holiday Market, to walk off our lunch and see some cool stuff they’re selling. That’s basically it this week. Before my eating out days are over, I really am planning on going to Cafe Sabarsky and Two Little Red Hens sometime, somehow next week. hey, she could get it as a groom’s cake! i don’t know whether there is a groom or not, but i figure the more cakes in any wedding the better. my girlfriend and i are surely going to end up with a groom’s cake, even though i don’t fully understand the tradition yet. i guess it is the nice good chocolatey cake that people actually want to eat as opposed to the traditional stiff white one, but i don’t know why!